The selection of a discrete manufacturing ERP should inevitable involve key personnel in your Manufacturing Operation, who would eventually use the system and help realize its value. The following steps would help corporate officers, senior management and manufacturing personnel jointly discover and adopt an optimum ERP solution. 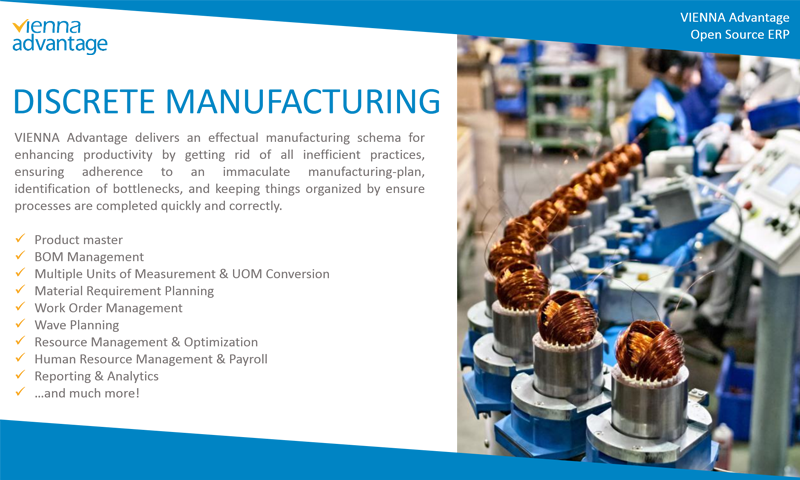 In addition to modern features of collaboration & business intelligence, workflow management for a high degree of automation, easy customization, cloud-deployment options, it has never been more important to address core manufacturing operations requirements while selecting a discrete manufacturing ERP. An ERP system that can imbibe the manufacturing strategy of a company and corporate strategy, is crucial considering that decision making happens, at both, corporate and plant levels. It should have a structure to enable both centralized and independent controls. The system should be able to distinguish the roles and responsibilities, products, cost centers, costs, product quality & service levels, cycle times and productivity of different plants. “Multi-“ is the key; whether multiple organizations, accounting schemas, charts of accounts, currencies, warehouses, units of measurement (UoM), pricelists, locations, costing methods and cost centers. An ERP that can accommodate the “Optimum” organization structure, ensure that skilled workforce is engaged, manage support systems and good governance objectives would be ideal. An ideal discrete manufacturing ERP should offer easy management of Organization-wise Product Categories, Details and Specifications, Product Design Management and Configurations, Bill of Material (BoM) Types and Multi-level Bills of Materials, Related & Substitute Products, Vendors, UoM and Conversions, Storage Details and Locations, Replenishment Rules and Accounting defaults, buy or make options, etc. The ERP should enable Allocation, Tracking costs to a product, capturing costs by various standard and custom costing methods. The key factors that affect achievement of manufacturing targets are quality, flexibility, productivity, asset and resource utilization rates and efficiency. Definitions of Work Centers, Production Resources (Assets), Standard Manufacturing & Inspection operations, Routing of Operations, Production Rule Set-up, Work Center Cost capturing, Real-time information of operation at each production resource and Wave Planning, Production Order Planning / Production Planning and Control features are necessary for almost any discrete manufacturing industry requirement. In addition, quick preparation of Standard & Custom Reports, Dashboard and KPIs, without the help of IT staff ensures that supervisors and managers spend less time on ERP transactions. A good discrete manufacturing ERP would help ensure that the skilled labour is engaged always and this is would help fulfill one of the most important functions of managers. The best productivity features to have would include Security, Scalability, Business-Intelligence (BI) & Reporting, Mobility, collaboration via Email, SMS, Calendars, Workflow, Alerts and Internal Chats within Transactions, Metrics and SLA Management. Other configurable functional modules such as Finance & Accounting, Procurement, Material Management, Sales & Marketing, Order Management, Customer Relationship Management, Helpdesk and Support, Time & Expense Management, Services Management, HRM & Payroll, Document Management and Warehouse Management System combined with productivity features would provide a comprehensive enterprise solution. Integration with third-party applications through web services or data acquisition from field devices or equipment would be essential steps, towards a lean organization. An ERP Product that covers all functional obligations of an enterprise, is built on a modern platform with an extendable open source architecture, with one-click upgrade, is Customizable without coding (using customization tools), has Strong Role Based Security, can be implemented quickly, Provides Extensive Support and Training, is committed to a path-breaking Development Roadmap and can easily integrate with other popular systems would be relevant to your organization for a long time to come. One is spoilt for choice, with hundreds of products, applications and custom modules available these days and it is easy to lose focus which selecting a discrete manufacturing ERP. If your goal is a lean organization, with a high degree of transparency, accountability and cost-sensitivity, a good manufacturing ERP solution could be one of the defining factors in building your competitive advantage. VIENNA Advantage ERP is a popular & sought-after brand across a variety of businesses world-wide. It has risen within a short span of time and has close to 1000 immaculate product implementations, to emerge as a top contributor to the global ERP and CRM market. VIENNA Advantage uses a ‘future-oriented structural design and solution approach to deliver a precise blend of unique, productive business features. VIENNA’s product portfolio range proffers all the solutions that you would need to equip your enterprise with. VIENNA Advantage Discrete Manufacturing Module provides an effective means to improving productivity by removing inefficient practices, ensuring adherence to a manufacturing-plan, identification of bottlenecks and to keep things organized by ensuring processes are completed quickly and correctly.